Technology has changed many aspects of our daily life. From the way we make phone calls to the way we shop, almost everything can be done more easily thanks to technological advancements. This is also true of dentistry where dental implants have completely changed the way in which we replace one or multiple missing teeth. This innovative tooth replacement solution is unique in that it restores both the root and crown of missing teeth. Traditional tooth replacements like fixed bridges and dentures only restore the crown, or part of the tooth visible above the gum line, leaving patients without the necessary dental support and stimulation they need to maintain the optimal level of oral health. Today, the dental implant supported tooth replacement process is continuing to improve, and many dentists consider it the gold standard in tooth replacement. 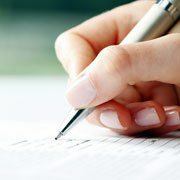 Before beginning any treatment plan, the Distinguished Dental team will schedule a consultation. Because each patient is unique, we’ll review your oral health and past medical and dental history to make sure a dental implant retained tooth replacement plan is right for you. 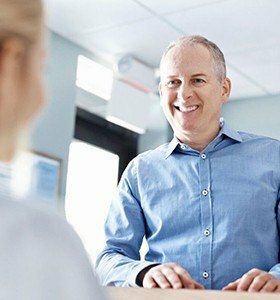 If you decide to move forward with dental implant tooth replacement, we are proud to provide comprehensive implant dentistry here at Distinguished Dental, which means we will complete your implant treatment from start to finish here in the comfort of our office so you will always be working with the team you know and trust. For the first phase of the dental implant process, we partner with a highly trained and experienced board certified oral surgeon who will place your implants here at our office. Working with an oral surgeon for implant placement ensures the most successful outcome for your dental implants. Once the implant post is in position, patients will need to wait three to six months to allow the implant to fuse with the gum and bone tissue through a process call osseointegration, which allows the implant to mimic the function of natural tooth roots. 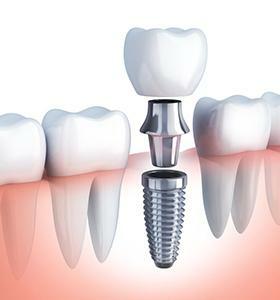 Once the dental implant post has fully fused with the jawbone, Dr. McIntosh will place your replacement tooth or teeth. Dental implants are capable of supporting a porcelain crown when replacing one tooth, which gives you the look, feel, and function of a natural tooth. If you are replacing multiple teeth, dental implants can be utilized to anchor a bridge, or support a denture, which can restore an entire arch of missing teeth. 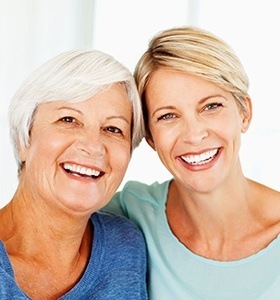 Dental implants work well for most patients and Dr. McIntosh can help determine if they’re the right treatment for you during a consultation where she will take x-rays and perform a thorough examination. Dental implants are a very reliable treatment with a 95% success rate. They also offer excellent longevity as they can potentially last a lifetime with great home care and regular dental checkups with Dr. McIntosh. This makes them a smart investment in your long-term oral health. 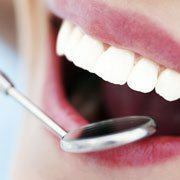 Contact Distinguished Dental today to learn more about how comprehensive implant dentistry can benefit you!